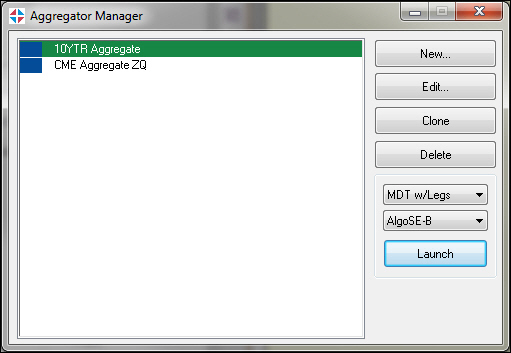 The Aggregator Manager dialog box is your interface for creating and managing aggregated instruments. Opens a new instance of the Aggregator Configuration dialog box, used to create a aggregated instrument. Opens the Aggregator Configuration dialog box, populated with the information for the selected instrument. Edit one instrument at a time. Duplicates the selected instrument and adds it to the list. The word 'copy' is added to the end of the spread title. Clone one instrument at a time. Deletes the selected instrument from the workspace. The first drop-down box lets you choose which window to launch the Aggregator instrument into and whether you want to launch the corresponding legs. MDT w/ Leg Columns -- Opens a single Aggregator MD Trader with additional columns exposed to show individual leg markets. MDT w/ Legs -- Opens the Aggregator MD Trader along with separate MD Traders for each leg. MDT-- Opens a single Aggregator MD Trader. MG w/ Legs -- Open a Market Grid seeded with the Aggregator instrument as well as the leg instruments. MG -- Opens a Market Grid seeded with an Aggregator instrument. Autotrader -- Opens an Autotrader seeded with the Aggregator. The second drop-down box lets you select an Algo Strategy Engine (Algo SE) to run your aggregated instrument. Aggregator requires an Algo SE to execute orders for aggregated instruments. The Launch button opens the selected aggregated instrument with the launching options you specified. Note: Hold the Shift or Ctrl keys to select multiple instruments.